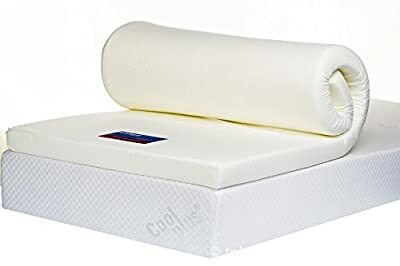 The Memory foam topper is placed on top of your current mattress to give better comfort, aid sleep and reduce muscle, circulation and joint problems. They can improve any uncomfortable mattress and are a great value alternative to replacing your whole mattress. Our toppers are available in a variety of sizes and thicknesses and you can choose whether to have your mattress topper with or without a cover, simply select the product that take your fancy above. The 7cm topper is our most popular as it offers excellent comfort without feeling perhaps too soft. The cover is optional but gives the product a more professional look and feel and can help to protect the memory foam increasing its lifespan. We use 40kg UK made Memory Foam in these toppers and make the mattress toppers ourselves. Please feel free to contact us if you have any special requirements as we can make these to any size. 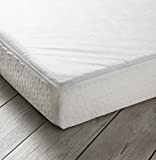 UK made memory foam Excellent pressure relieving qualities Improves any uncomfortable mattress Amazon value for money All Ikea / European sizes available. Call for more information.